The Center Flow Tangential Aerosol Generator (CENTAG) is the first of CH Technologies' next generation aerosol generators. 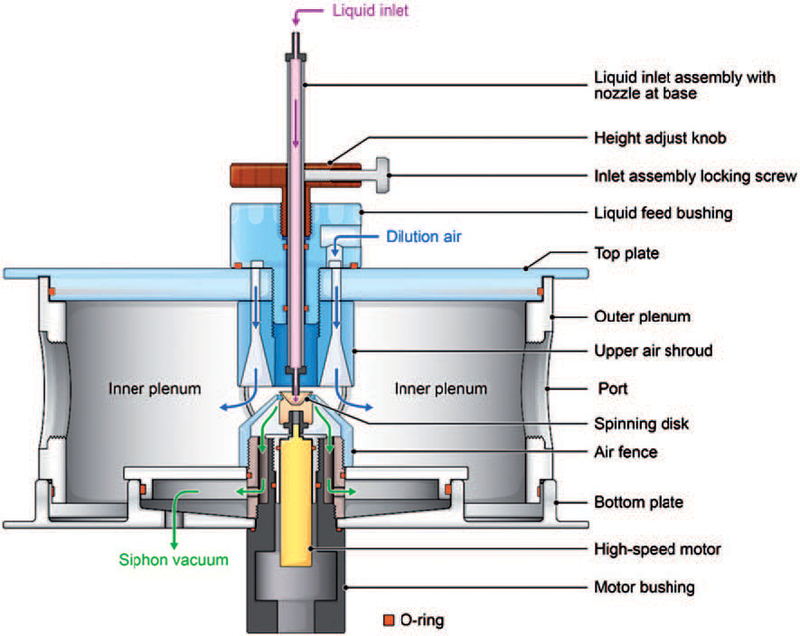 CENTAG functions by having a liquid flow onto the center of a rapidly spinning cup or disk. This action results in the production of an aerosol by the tangential shear force. The resulting aerosol has two sizes or peaks; a mono-disperse peak of a larger size, and a distribution of smaller satellite particles. The larger main particles are separated from the satellites by means of a vacuum drawn around the central cup or disk. This forces the remaining aerosol to be mono-disperse. The CENTAG is designed to form a quasi mono-disperse and wet aerosol at the nose and mouth of the subject during inhalation exposures. The CENTAG has great potential in bio-aerosol studies due to the superiority of single pass systems involving exposure to live bacteria or viruses. In addition, the CENTAG can generate the larger particle aerosols required for some studies. Unlike other historical and current designs, our CENTAG is a motor driven device. It is specifically optimized for operating under lower flow rates. The CENTAG offers a significant benefit over traditional bio-aerosol generators that tend to severely damage, if not kill, many of the sample bacteria and viruses. 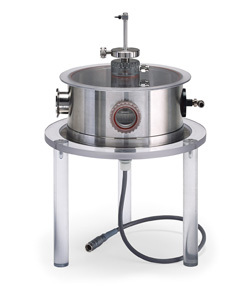 The CENTAG has the capability to deliver a higher percentage of live bacteria and viruses to the breathing zone because the acceleration of the cup or disk is the only force acting on the particles.